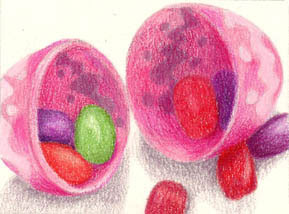 Sherry's Colored Pencil Corner: Illustration Friday - "Hide"
I guess it's the time of year, but thinking about "Hide" immediately made me think of Easter eggs...although I prefer the chocolate sort to jellybeans, I loved the colors in this Morguefile reference pic I found by ladyheart. ACEO size, Prismacolors on Rising Bristol White Vellum. Ooooohhhh- pretty! Fun colors! I can taste the jelly beans in my mind. Very nice work. I could almost eat them. Darnit, now I'm hungry! I like the color saturation - is this an effect of using Rising paper? I should try that stuff, I keep hearing good things about it. Thanks! Great concept. The jelly beans and egg halves have a nice roundness to them that pushes them off the page. That and the vibrant colors. Thanks for the comments, all! This was a fun one, I loved the colors, too.